Xiaomi has announced its 100W Super Charge Turbo fast charging technology, claiming that it can fully charge a 4,000mAh phone in just 17 minutes. In a video shared by CEO Lin Bin, the technology is shown off competing against Oppo’s Super VOOC Flash Charge. 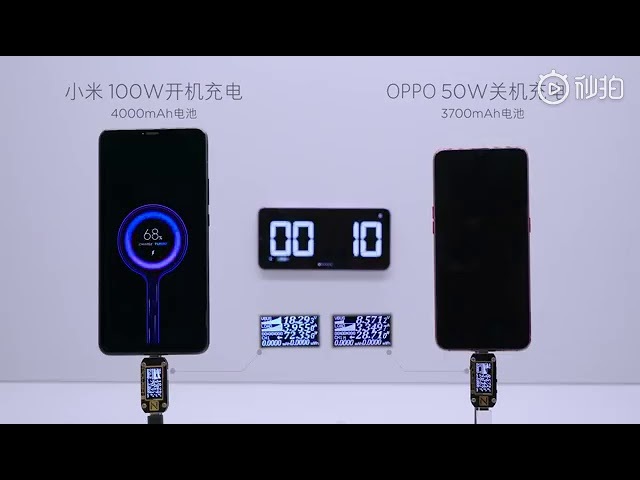 A 3,700mAh phone is charged 65 percent in 17 minutes via the Oppo Super VOOC technology, while Xiaomi’s 100W Super Charge Technology manages to charge a 4,000mAh smartphone fully. Furthermore, Redmi Head Lu Weibing also announced that this technology is already in mass production, and a Redmi phone will adopt it first. Xiaomi made the 100W Super Charge Turbo Technology announcements on Weibo. While the technical details are minimal at this point, CEO Lin Bin shared a video (re-uploaded on YouTube) showing off its fast charging capabilities. The 100W Super Charge Turbo fast charging technology could fully charge a 4,000mAh phone in just 17 minutes. In comparison, Oppo’s proprietary Super VOOC Flash Charge fast charging technology was able to charge a 3,700mAh phone to 65 percent. There’s no word on when this technology will launch in the market, or which Xiaomi phone will integrate it first. However, Weibing has taken to Weibo to announce that Super Charge Turbo is already in mass production by the Redmi team. This means a Redmi phone will integrate it first, and given that it is in mass production, the phone should be unveiled soon. Weibing didn’t reveal the name of the phone, or its launch timeline. We can expect Redmi to make more announcements on this phone soon. Redmi is working on a flagship phone with the latest Snapdragon 855 SoC on board. This could be the device that sees the Super Charge Turbo integration first, but this is pure speculation, and should be taken with a grain of salt.